There was a couple of talks at Nordic Game Conference 2012 that dealt with fundraising in the games industry. - Paul Heydon (@pheydon) talked about fundraising for game startups. He covered things to keep in mind when trying to grab the attention of VC's and investors. Check out video, copy of pdf, and notes from the talk after the break. - Panel debate with a Q&A session, with VC and investor representatives, which included Mary Carty (CEO, Spoiltchild), Kwasi Asare (Fighter), Fred Hasson (Games Capital) and Marko Tulonen (Vision+ Fund) - notes after the break. Videos and notes after the break! Draw something is why investors are getting interested. #1 activity on mobile and Facebook "is gaming"
Important to track users, and see how they behave in order to be taken seriously by investors. Initially you raise money from "friends, family and fools." Angellist is the best site for angel investors. Google ventures only currently invest in US. Mail.ru is a games business - over half of their income comes from games. Paul Heydon on getting fundraising: "Raising money from VCs are like marriage, and divorce is difficult." VC meetings "normal" structure: you've got one hour to make an impression, and that's all you're likely to get. Make sure to leave 15 min at end for Q&A. Check seedsummit to figure out what term sheets are, why it's nice to have several, etc..
Never ever give up control of the business. Downhill slope from there. "Walk away from incubators with no money" if they take stake in your company - there's other options out there. Often game company founders strike deals that are bad. Should talk with people who used the incubator/investor and ask "was it worth it?" Before you jump in bed with someone check them out and know what you're getting into. Q: Investors, what is a big red flag for you? - when they come and want money, but unclear on how they'll come back to investors.- if you ask for money, be clear with what you want to do with the money, and show that you'll be able to put the money to good work- know what you need - think through marketing aspects and post-live development, to ensure that project goes to market.- product is important, but if you don't know your audience and how you'll market it, it makes it hard to be taken seriously. Q: Trends and areas interesting for investors - what is hot right now?- geolocal games / geolocal integrations- mobile and social is something investors interested- investors are a bit herd like, they go where their colleagues go- its important to be able to tell a good story, and maybe even have a community around something you already created. Q: how to attract good startups, how to find good teams?- Chile, Montreal, etc are investing directly into startups. San Francisco made hotel complex to put tech and creative teams together.- make it easy with Visas and work permits to pull people/teams to get people attracted, especially foreign talent. Lean start-ups (small teams)- easy to work with, easier to invest more risky- lean forces you to get out of the garage super fast- a no BS solution, with real ideas, real solutions- a lot of creative have a strong notion about perfect. But perfect doesn't work, find a customer, get their credit card. Perfect is never perfect. (Important) Have an MVP and have things tested before you approach VC or funding. Q: How did you make your money back? Is there like a cap on how much you're willing to invest, and how much control should we give up?A: Todd - a guy came to us with nothing more than a great idea, just concept, idea and a delivery plan. He kept half of his company, and landed a huge investment, just by being clear and well prepared for the meeting. Q: preferred point in development when people should contact you?- nice to have a product that has some customers. But should have something "wrong" with it, that needs cash and money to fix what's wrong. Q: Kick starter and the future of investors?- crowd cube - kickstarting for investors- Great way to work on messaging and pitch.- Kickstarter works well if you have a track record, like if you're Tim Schafer- in the future it'll be hard to stand out when there's so many project, like the app store.. Approach VC/investors the same way you would with kickstarter! Sell your story! Be where your audience is! Start your story, and tell it, all the time. 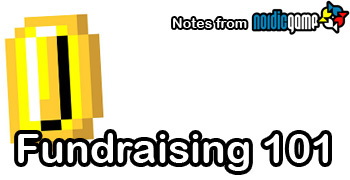 Q: Is fundraising even possible for educational games? Depends much on the education system in each country. A lot of red tape, regulations. Also depends on how much an education dept. has..
Tough genre to find investment for. Get the attention of not only the children but also the parents. If there was money, we could massively improve the education system!! Hard to raise money for educational games.We need to show government and teachers that games are more and better than fps and mmorpgs.Part of it is because it's based on 19th century paradigm. Until the paradigm changes it'll be very difficult to get games involved. If you can get nice tech into the school interactive whiteboard you might be on to something.